Before 'Breaking Bad' came to dominate the whole of our lives, 'Mythbusters' rightly got the chance to put the science of Walter White to the test with a special surrounding the acclaimed AMC drama. Now that 'Breaking Bad' is dead and buried however, 'The Walking Dead' will be the next to rise with its own 'Mythbusters' spot this October, the first photos of which have emerged! Via TVLine, the October 17 'Walking Dead' installment of the Discovery Channel series will see Adam and Jamie putting several zombie-related myths to the test, with the help of fallen cast member Michael Rooker. Among the Myths set to be tested, the trio will determine what weapon would best put down a walker, as well as how the zombies tend to catch up to their faster victims. 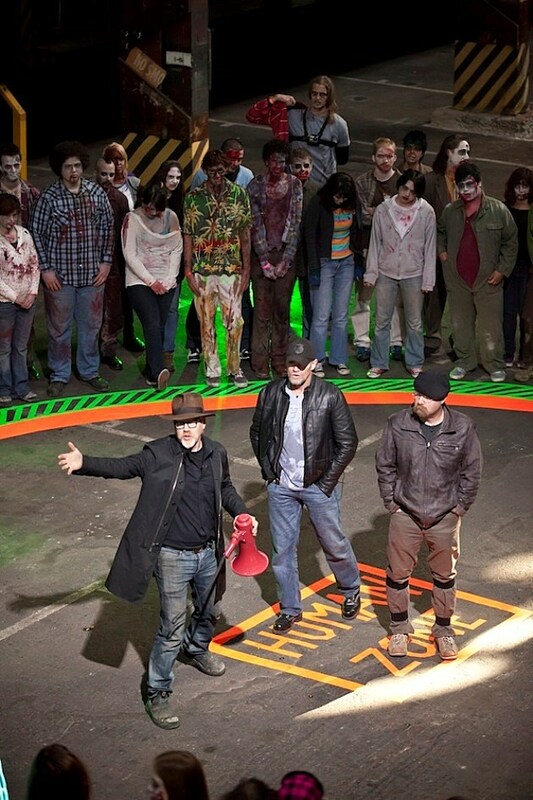 Initially announced back in February, the episode has also finally shambled out its first sneak peek, featuring Jamie Hyneman, Adam Savage, Michael Rooker, and a whole herd of walkers surrounding them, extras of which were invited to join the original shoot. 'The Walking Dead' itself will premiere on October 13, so take a first look at 'Mythbusters' special below, and tell us in the comments which common zombie myths you'd most want to see put to the test when Adam and Jamie get involved!